In view of local optimization in particle swarm optimization algorithm (PSO algorithm), chaos theory was introduced to PSO algorithm in this paper. Plenty of populations were generated by using the ergodicity of chaotic motion. The uniformly distributed initial particles of the particle swarms were extracted from the populations according to the Euclidean distance between particles, so that the particles could uniformly distribute in the solution space. Local search was carried out on the optimal position of the particles during evolution, so as to improve the development capability of PSO algorithm and prevent its prematurity, thus enhancing its global optimizing capability. 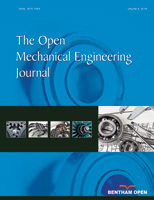 Then the improved PSO algorithm was applied to mechanical design optimization. With optimization design for two-stage gear reducer as the study object, objective function and constraint conditions were determined by building a mathematical model of optimization design, thus realizing optimization design. Simulation and comparison between the improved algorithm and unimproved algorithm show that improved PSO algorithm can optimize the optimization results of PSO algorithm at a faster convergence rate.